Excellent distinction. Inference is harder to teach and to learn. You make some good specific points about the challenges of evaluation and the technical aspects evaluation design. However, I do not agree that Gates was suggesting that measurement alone be the intervention that has and will lead to improvements in health and educational outcomes. “Organizations working to change the world should set clear goals, choose an approach, measure results, and use those measures to continually refine the approach, “ Gates said. There is good deal more to this phrase than measurement. I also think that his article, which was appropriately placed in the Wall Street Journal and not the scientific literature, was written in a detail well suited to the audience. To me, his brief examples were less about defending specific interventions than asserting that it was possible to solve some of our world’s most persistent problems if we begin to try. A message I applaud and think we all need to hear. I agree with the main point Gates made—measurement matters. And I agree with you—measurement is not the only thing that matters (arguably something that was implied by Gates). My point was, I suspect, equally noncontroversial—how we use measurements matters. Gates made poor use of measurements. Perhaps my objections can be characterized as technical or specific, and the Wall Street Journal as a non-technical publication. This does not reduce the responsibility Gates had to use empirical evidence well to reach sound conclusions. As evaluators, our job is to look past our own biases (I too find his message appealing) and examine the logic and evidence that support claims about how to make the world a better place. In this case, I believe Gates fell short, which sadly undermined an important, noncontroversial message. It seems it is risky to make inferences in most situations. In regards to Gate’s testimony of the successes in Education, what would you do differently to ensure the measurement and inferences are accurate? We need to make inferences whenever we estimate impacts. There is no way around it. First, we should use the most robust measures and inferences we can manage given the real-world circumstances in which we are working. 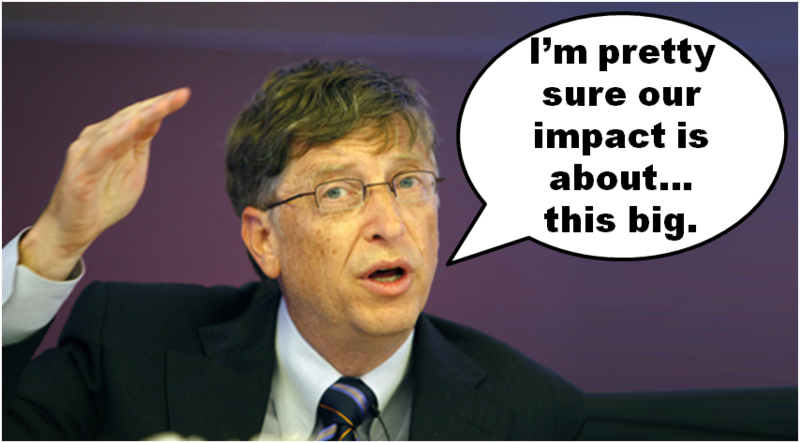 Perhaps Gates did. I cannot say. Second, we should fully disclose the weaknesses in our measures, inferences, analyses, data, etc. I don’t believe he did this. That is disappointing. Evaluators have a duty to disclose, and readers have a duty to question.